This spicy vegetable dish contains carrots, tomatoes, green peppers, onions, chillies and spices. The mild flavour is easier to enjoy than the hot variety but still has a great flavour. 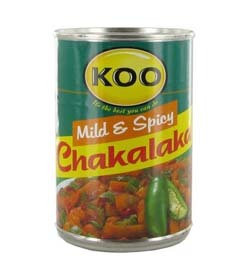 Chakalaka can be served on its own, but also goes great with curries, stews, potatoes or rice, on bread or in a sandwich. Vegetables (minimum 52%) (Carrots, Onions, Cabbage, Chillies, Peppers), Water, Tomato Puree, Sunflower Oil, Spices, Salt, Maize Starch (E1401), Acid regulator (E330).